IBC NEWS www.postmagazine.com 14 POST OCTOBER 2016 MAXON COLLABORATES WITH NVIDIA FRIEDRICHSDORF, GERMANY — Maxon (www. maxon.net) has announced a comprehensive, multi-year agreement with Nvidia (www.nvidia. com) that gives Maxon access to Nvidia rendering technology, including its Quasi-Monte Carlo (QMC) sampling patent family, Nvidia Iray and Material Definition Language. Additionally, artists and designers using Cinema 4D can now access Iray for Cinema 4D, a plug-in that provides scalable, intuitive, physically-based rendering for accurate previews when lighting and designing a scene or adjusting a scene's geometry and materials. Those interested can register for a free trial. In a future ver- sion of Cinema 4D, users will have easy access directly within the application to download and purchase the Nvidia Iray plug-in. "Maxon has enjoyed a successful and supportive collaboration with our development partner Nvidia to lever- age its GPU-based technology for Cinema 4D users," says Maxon's Oliver Meiseberg. "We look forward to working more closely togeth- er to provide 3D solutions for customers across industries and disciplines." 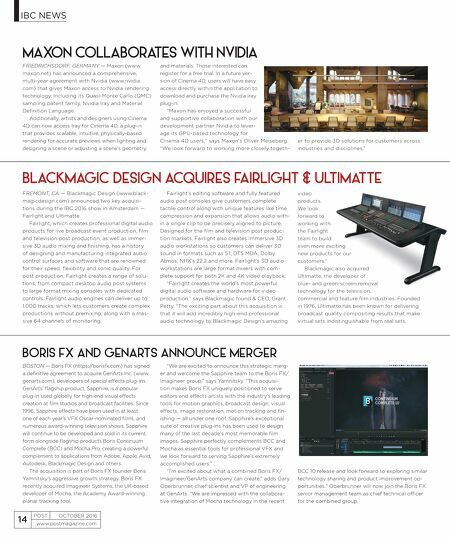 BLACKMAGIC DESIGN ACQUIRES FAIRLIGHT & ULTIMATTE FREMONT, CA — Blackmagic Design (www.black- magicdesign.com) announced two key acquisi- tions during the IBC 2016 show in Amsterdam — Fairlight and Ultimatte. Fairlight, which creates professional digital audio products for live broadcast event production, film and television post production, as well as immer- sive 3D audio mixing and finishing, has a history of designing and manufacturing integrated audio control surfaces and software that are renowned for their speed, flexibility and sonic quality. For post production, Fairlight creates a range of solu- tions, from compact desktop audio post systems to large format mixing consoles with dedicated controls. 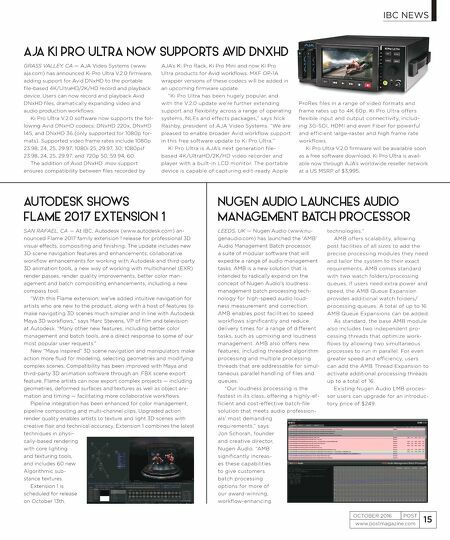 Fairlight audio engines can deliver up to 1,000 tracks, which lets customers create complex productions without premixing, along with a mas- sive 64 channels of monitoring. Fairlight's editing software and fully featured audio post consoles give customers complete tactile control along with unique features like time compression and expansion that allows audio with- in a single clip to be precisely aligned to picture. Designed for the film and television post produc- tion markets, Fairlight also creates immersive 3D audio workstations so customers can deliver 3D sound in formats such as 5.1, DTS MDA, Dolby Atmos, NHK's 22.2 and more. Fairlight's 3D audio workstations are large format mixers with com- plete support for both 2K and 4K video playback. "Fairlight creates the world's most powerful digital audio software and hardware for video production," says Blackmagic found & CEO, Grant Petty. "The exciting part about this acquisition is that it will add incredibly high-end professional audio technology to Blackmagic Design's amazing video products. We look forward to working with the Fairlight team to build even more exciting new products for our customers." Blackmagic also acquired Ultimatte, the developer of blue- and green-screen removal technology for the television, commercial and feature film industries. Founded in 1976, Ultimatte has been known for delivering broadcast quality compositing results that make virtual sets indistinguishable from real sets. BORIS FX AND GENARTS ANNOUNCE MERGER BOSTON — Boris FX (https://borisfx.com) has signed a definitive agreement to acquire GenArts Inc. (www. genarts.com), developers of special effects plug-ins. GenArts' flagship product, Sapphire, is a popular plug-in used globally for high-end visual effects creation at film studios and broadcast facilities. Since 1996, Sapphire effects have been used in at least one of each year's VFX Oscar-nominated films, and numerous award-winning television shows. Sapphire will continue to be developed and sold in its current form alongside flagship products Boris Continuum Complete (BCC) and Mocha Pro, creating a powerful complement to applications from Adobe, Apple, Avid, Autodesk, Blackmagic Design and others. The acquisition is part of Boris FX founder Boris Yamnitsky's aggressive growth strategy. Boris FX recently acquired Imagineer Systems, the UK-based developer of Mocha, the Academy Award-winning planar tracking tool. "We are excited to announce this strategic merg- er and welcome the Sapphire team to the Boris FX/ Imagineer group," says Yamnitsky. "This acquisi- tion makes Boris FX uniquely positioned to serve editors and effects artists with the industry's leading tools for motion graphics, broadcast design, visual effects, image restoration, motion tracking and fin- ishing — all under one roof. Sapphire's exceptional suite of creative plug-ins has been used to design many of the last decade's most memorable film images. Sapphire perfectly complements BCC and Mocha as essential tools for professional VFX and we look forward to serving Sapphire's extremely accomplished users." "I'm excited about what a combined Boris FX/ Imagineer/GenArts company can create," adds Gary Oberbrunner, chief scientist and VP of engineering at GenArts. "We are impressed with the collabora- tive integration of Mocha technology in the recent BCC 10 release and look forward to exploring similar technology sharing and product improvement op- portunities." Oberbrunner will now join the Boris FX senior management team as chief technical officer for the combined group.